Liam's granddad owns a tacky seaside tourist attraction called Nursery Rhyme Land, which campaigners, led by the formidable Mrs Porteous, want to close down because it has stuffed animals dressed up as nursery rhyme characters. In the space available here, I cannot do justice to the pacy plot and humorous characters. 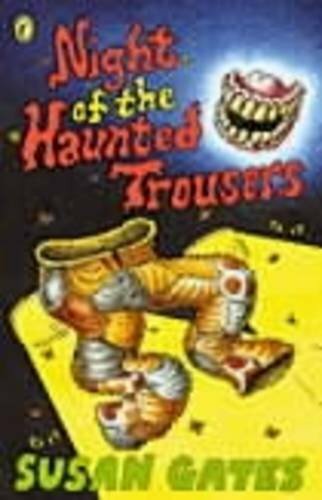 Suffice to say that the story centres on a pair of cat-skin trousers which, when worn by an individual who also happens to be wearing a pair of ancient false teeth, makes that individual turn into Nursery Rhyme Land's original creator's apprentice! Throw in a precocious journalist (granddaughter of Mrs Porteous), a workaholic geneticist (mother of Liam) and a freaky fainting goat and you have the framework of a most entertaining read. There are tiny illustrations in the top right-hand corner of each spread which form a 'flicker book' about a goat which leaps up and then lies on its back in a faint every time it hears a loud noise. The sleeve notes inform the reader that such goats actually exist and originate from Tennessee!